The Seven Kingdoms stand on the brink of war. Flanked by a full-blown army of Unsullied troops, impossibly huge dragons, and Dothraki warlords, Daenerys Targaryen has traveled across the Narrow Sea to complete her quest and seize control of the Iron Throne; after much hand-wringing and scheming, Cersei Lannister now rules over King’s Landing and the remainder of Westeros; while up North, Jon Snow braces for the oncoming White Walkers and their reanimated Wights. That is, in essence, the three-way power struggle that will be fuelling Game of Thrones season 7 – and we’ve barely scratched the surface. On hand to shed new light on HBO’s next chapter is Entertainment Weekly, after unveiling four all-new action shots in anticipation of the show’s July return. 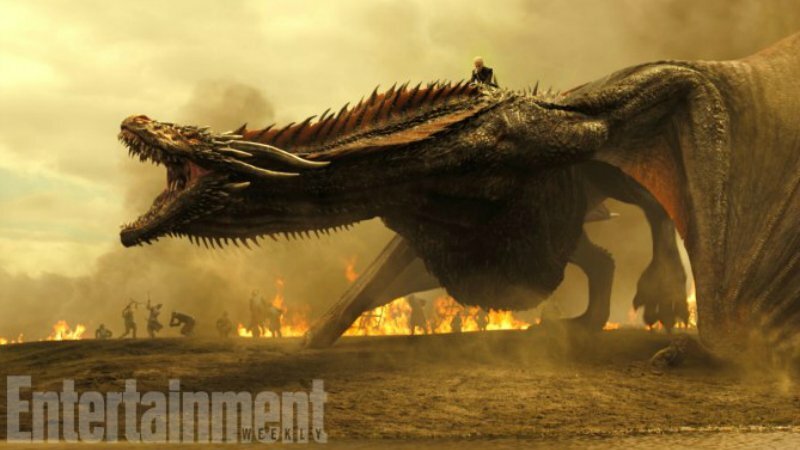 The one that will no doubt spark heated debate online is the pic showcasing a nearly full-size Drogon charging into battle. Perched on its back is Emilia Clarke’s fearless Daenerys, and the fact that HBO has unveiled said action shot this far ahead of the premiere leads us to believe that the battle scene takes place fairly early on in Game of Thrones‘ seventh season. Other pictures draw attention to both Jon Snow (Kit Harington) and Petyr Baelish/Littlefinger, who can be seen standing alongside Sansa Stark. In light of everything that transpired in season 6, the fact that Littlefinger is seen here sharing a scene with Sophie Turner’s flame-haired Stark will undoubtedly raise concern among fans – without divulging too much, Baelish essentially planted the seeds of doubt in Sansa’s mind just as Jon Snow was crowned King of the North – but whether this interaction will have much of a bearing on season 7 remains to be seen. Another image worth discussing is the one featuring Arya Stark, who looks to have ventured into a northerly setting on horseback. Winterfell, perhaps? Game of Thrones season 7 is, rather fittingly, a seven-parter, and you can expect the first episode to premiere via HBO on July 16th. This new batch of episodes will be based on some of the show’s finest scripts yet – according to Iain Glen, at least – and there’s already been chatter of a prequel series setting up shop at the network.